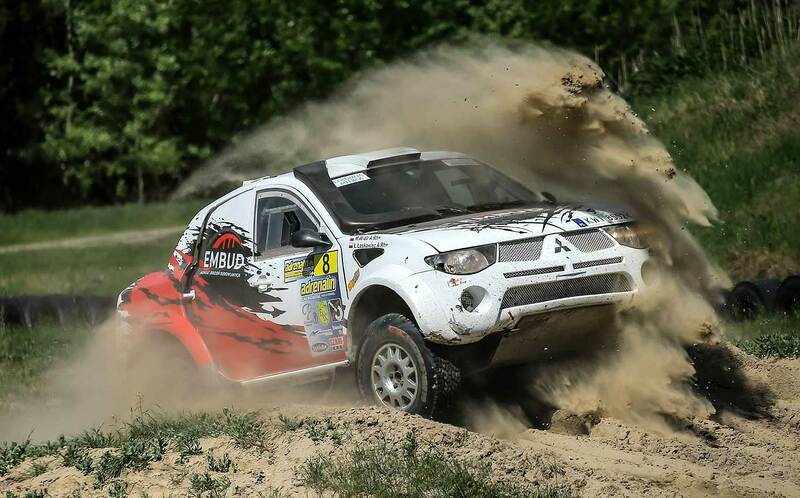 After the cancellation of the primary opener of the Hungarian MNASZ Rallyraid Championship, "Duna Aszfalt Kupa" end of March, it was the "Adrenalin Kupa" last weekend (April 20-22) to open the Hungarian Season and to held the third round of the Central European Championship (CEZ). The event was open for bikes, quads, SSV, cars and trucks and offered also a special "amateur-like" challenge class. After the stage on Saturday (see special report in our news section), the Rally-Sunday offered two more specials on the schedule. Among cars, the duo Miroslav Zapletal / Marek Sykora (Ford F-150 Evo) gave no chance to their rivals, after winning both specials on Saturday they made a clean sweep again on Sunday. "We tried a new setup, but it didn’t really work, so this was the fastest time we could achieve," said Zapletal. "We are happy for the victory and we’ll be back for the other rounds of the championship." Second best time was clocked by Poland’s Mariusz Wiatr and Lukasz Laskawiec (Mitsubishi L200), and with this result they won the TH category (production cars). Father and son duo Zoltan and Bence Kaposi scored the third best time and second place in T1, despite losing the brake at km 6 of the first special on Sunday. In category "Challenge" the female crew Szandra and Alexandra Miklos successfully brought the Toyota Land Cruiser home in their first ever cross-country rally event, despite having technical problems. Among SSVs, Szilveszter Kery and Barbara Bartha (Can-Am) weren’t overconfident despite their four minute advantage, they were aware that based on their pace on Saturday, the crew Akos Jobbagy and Peter Krajnyak shouldn’t be underestimated. 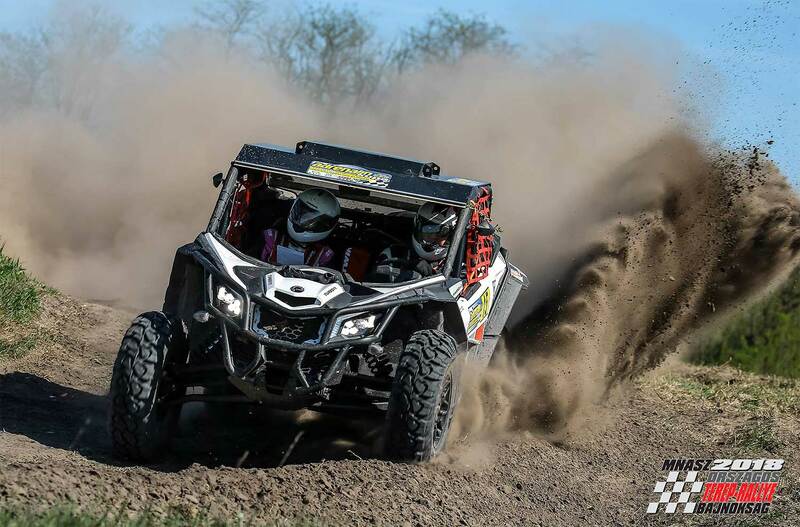 But a minor technical problem with the safety harness of the co-driver deprived Jobbagy and Krajnyak from the chance to fight for the victory, and even relegated them the third place, 21 seconds behind Czech Republic’s Ladislav Zavrtalek and Ivo Sevcik (Can-Am). "We had a fairly good race, there were real cross-country rally type tracks with deep sand and big bumps," said Kery after the race. "Akos collected a big gap in the first special yesterday, but we were in battle up to the finish, and maybe my experience paid off and helped us to win. This was a very pleasant rally, in the last special we drove at maximum speed again, Barbara did a perfect job with navigation, we didn’t have a single mistake." 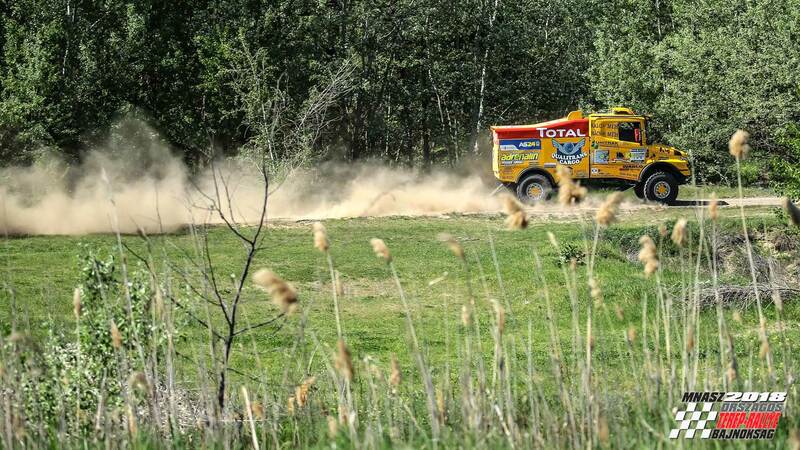 Among trucks, the victory of Miklos Kovacs and Laszlo Acs (Scania P380) was not in danger for a second, they won both specials also on Sunday, in front of the Tatra crew led by Istvan Madarasz. 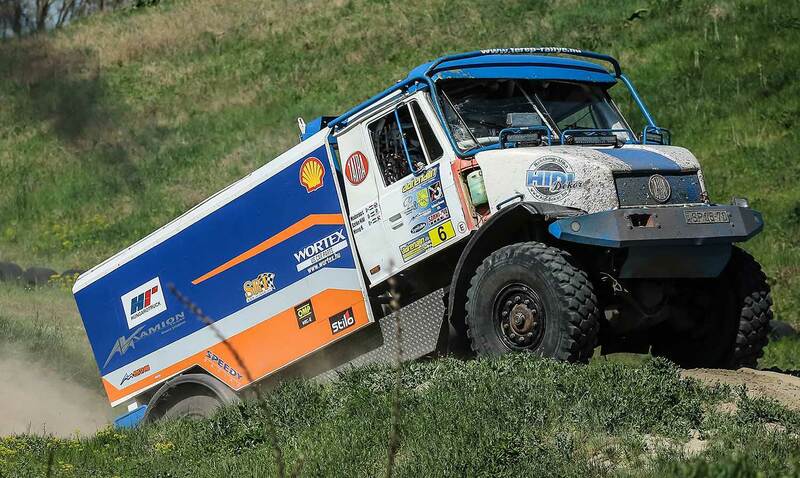 The DAF of Viktor Merkovics got into a tight situation: The crew got stuck in a water ditch and had to be towed but they managed to finish the race in third place. In bikes and quads category, Richard Hodola (Yamaha) kept the lead until the finish line, followed by Czech quad rider Viktor Chytka (Suzuki) in second place and Lajos "Laller" Horvath in third. Viktor Majer had to quit the race due to electronic problem on his Husqvarna, but David Neisz managed to finish his first ever attempt at cross-country rallies successfully, despite a leg injury caused by a crash on Saturday. Moreover, the rookie rider even clocked a 2nd time in the last special! In the overall classification, he was 6th behind Peter Karpati (KTM) and Slovakian quad rider Sandra Ulrichova (Yamaha). "On Sunday we had two specials, in the first one I was neither fast, nor enjoyed it. For the second one, I became faster, that was similar to my Saturday pace. I am happy that there was no accident, no crash, this was a good training and, of course, I am happy with the result," Hodola said. “We are happy that the competitors seem to have enjoyed the weekend, we hope to have a much bigger entry list next year. 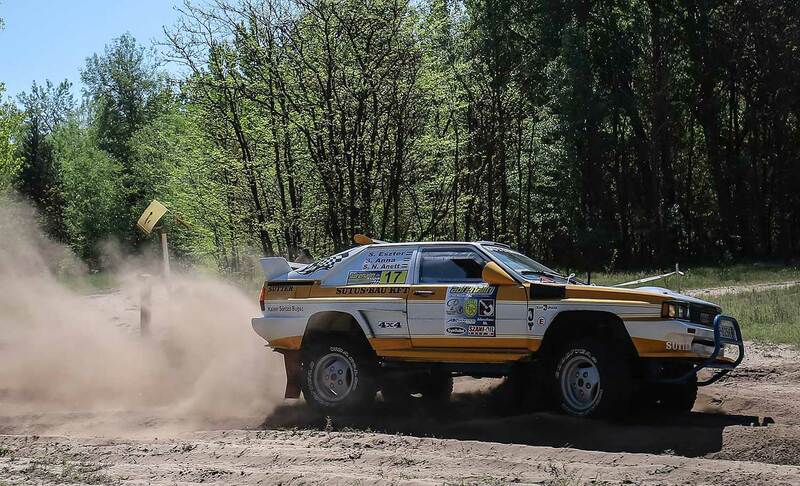 We would like to say thank you to KEFAG Zrt, to Kiskunsag National Park, and to the municipalities hosting the rally route, especially to the municipality of Bugac," Imre Varga summarised the weekend on behalf of the organisers. Next round of the Hungarian Championship and CEZ Championship will take place on 11-12 May.